When Can A Court Order Be Modified? Court modifications can be exceptionally beneficial to those who have gone through a divorce a few years previously and want to make some changes to their current situation. A court order can affect your day-to-day activities and a modification can help you smooth out those unnecessary bumps. Sometimes, adjustments need to be made, especially if the circumstances change. For example, if you went through a divorce a few years previously and you’ve been paying child support and alimony and then you lose your job, you’d need to make some changes to the amount you’re paying. Additionally, sometimes the court orders become out of date or the child has grown up and changes need to be made. Whatever the reason may be for a court modification, our family law attorney can help you achieve an outcome that you want. If you’d like to make some changes, then contact a family law lawyer at our Top Rated Local® Law Firm. What Is A Court Modification? Is It Possible To Modify One In Arizona? Yes! As a Tempe based family law firm, we can help you go through the court modification process. Divorce can be very messy and a long process, so sometimes, things can fall through the cracks. Additionally, many couples aren’t thinking clearly and are more focused on resolving issues that are at the forefront of their mind. For this reason, it can be beneficial to work with a family law attorney to make changes to the court orders. Circumstances change, which is why modifications can be made. Many changes to court modifications can be a positive thing, but occasionally, it can cause more problems, especially if the couples won’t agree on some of the changes that helped finalize their divorce. Many court modifications tend to be in the realm of family law. So how can a court modification be changed? What needs to be done to put these changes in motion? 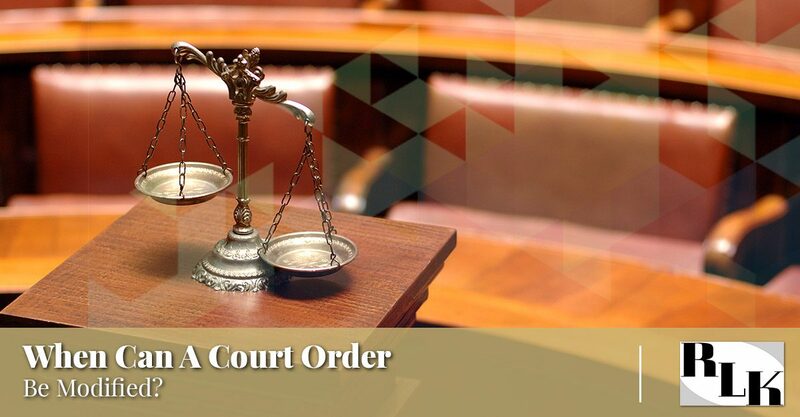 Generally, you’re unable to change a court order without evidence that pertains to the circumstances. For example, if you’d like to change a custody agreement, you’ll need to show evidence of violations of the current custody order or a job change. If the child has grown older and would like to spend more time with one parent than the other, then they can do that as well. Once you have the evidence to change the court order, you’ll want to receive a petition from the court to modify the order and show that the changes are within the child’s best interests. A modification request should be completed and the court will make a decision if the petition has merit. For this reason, it can be beneficial to hire a family law attorney to ensure the modification follows the requirements. The Law Office Of Ronald Kossack has helped many people make modifications to court orders. We have experience with spousal maintenance awards, parenting time, child support, and child decision making. With over 20 years of experience in family law, our Top Rated Local® Law Firm has represented clients like you who want to make a change in their family situation. If you’d like to make some changes to your court orders or you’re dealing with family law problems, then our law firm is the right place to visit. We can help you get the outcome you want by creating an effective strategy to change your current situation. Reach out to us to learn more about what our master litigator can do for you. When Should Child Custody Modifications Be Considered? When Should Modifications Be Considered In Child Custody?